I already spoke of this game in one thread, but I decided I could talk some more of it. Pirate's Cove by Day's of Wonder. Like my Munchkin "review", this will most likely be more of a game presentation rather than a review, but here goes. 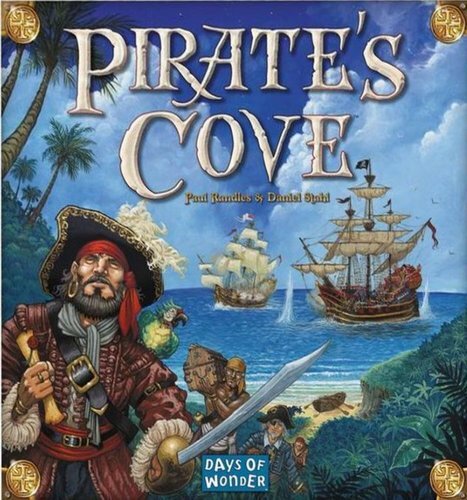 Pirate's Cove is a fun game, where your goal is to become the most famous pirate in the local seas. You have 12 months of time to build your name by the means of battles, raids and treasure. Rules are a bit complcated at first, but after few tries, you will get a hang of them. 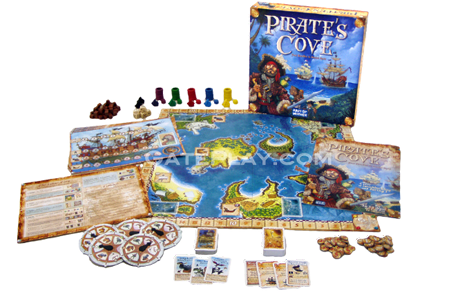 The board consist of 6 islands, which are named after what you can do in each island and the Pirate's Cove. You put a treasure card on each island except the Treasure Island and Pirate's Cove. A month in the game is one round and a round consists of 6 phases. Treasure phase, Navigation Phase, Combat Phase, Plunder Phase, Upgrade Phase and Black Ship Phase. In Treasure Phase, you reveal, what kind of treasures each island holds that month in the form of Fame, Money, Treasure Chests and Tavern cards. Fame, of course, are the points you collect to win the game. Money lets you upgrade your ship. Treasure chests, when buried to the Treasure Island, give you Fame. Tavern cards have varied effects, which I won't list here. You can also buy them from the Tavern island. In Navigation Phase, each player chooses, which island he/she heads and then it is revealed at the same time. This choise should be made carefully, as other players might want the big treasures too. If two or more players choose the same island, the game advances to Combat Phase, where the players fight to sink eachother's ship, so they can claim the loot for themselves. Battles are are held by rolling dice. The player with greatest value in Sails goes first. You can roll dice equal to the number of your Crew/Cannons (whichever is lower, max 6). You hit with 5 or 6. You can choose, which part of your opponents ship you want to hit. If the chosen part goes under the chart, the ship sinks and remaining players will get one Fame point and the loser is drifted to Pirate's Cove to lick his wounds. In Plunder Phase, you plunder the island and take the treasures the appropriate treasure card shows. Then you advance to the Upgrade Phase, where you buy things to improve your ship. You can buy Tavern cards from Tavern Island, improve Sails in Sail island, improve Hull at Hull Island (hull value marks, how many treausre chests you can have in your ship) and so on. You can't upgrade your ship in Tavern Island and in treasure Island, you can bury gold and treasure to get Fame. In Black Ship Phase, you move the Black Ship, which represents a legendary pirate that haunts the seas. These pirates are famous names like Edward Teach AKA Blackbeard, The Flying Dutchman or Captain Hook. Legendary Pirates are very strong and require strong ship (and lots of luck) to defeat, but they give lots of Fame. That is one round and after Black Ship Phase, the rounds starts again, new treasures are turned and the game advances like this, until no treausre cards are left. Then, the one with most Fame points is declared as the most fearsome pirate of the seas and wins the game.